I am searching through the rubble looking for the bull’s head and the bull’s tail. I have found the head but I have gone through the other rubble and cannot find the tail. I have watched video walkthroughs but at no point does Indy say the rubble is loose so I am stuck on Crete and am unable to find the tail and proceed. Has anyone else had this issue or am I missing something? 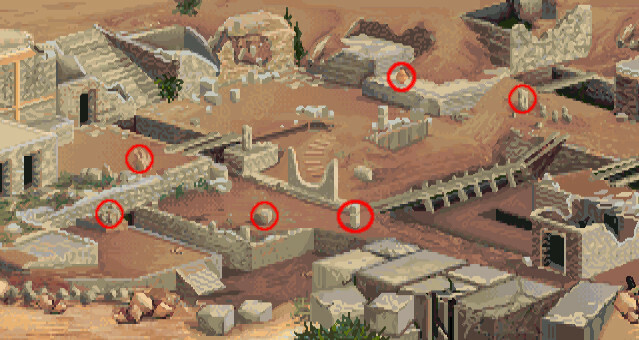 Did you try all these circled locations? The tail is usually pretty close to the head (on the same side of the horns). Thanks for the screenshot Timovieman! Yep I tried all the hotspots but can only push the rubble closest to the horns. I’ll see if I can upload a video which may help explain my issue. As you can see in the video I am unable to push any of the other rubble hotspots and the same thing happens if I click Look at and then push. Am I missing something? There’s another set of stones to the right of where the bullhead is (near the right horn). I’ve reuploaded my earlier screenshot. I’d forgotten about that set of stones. That did it! I knew I was missing something but I’ve been able to get past the section now finally! Thanks a million!